It is hard to derive a singular standard definition of electricity, mainly because we use the term for various different things. Static electricity, the electricity in the wires, and even that thing that is transferred when lightning strikes, these are just a few examples of where we use the term. While, they all have a similar foundation, it is hard to club them together. Which is why, if you are having a tough time defining electricity, know that you are not the only one. Even scientists and engineers have a tough time agreeing on a single concise definition of electricity. In the most basic terms, electricity is an energy force that is created between two electrons. However, rather than focus on what electricity is, let’s see how it affects us. Electricity is provided to through wires. Even though we use it on a daily basis to power all of our devices, we never really stop to think where is comes from and how it works. 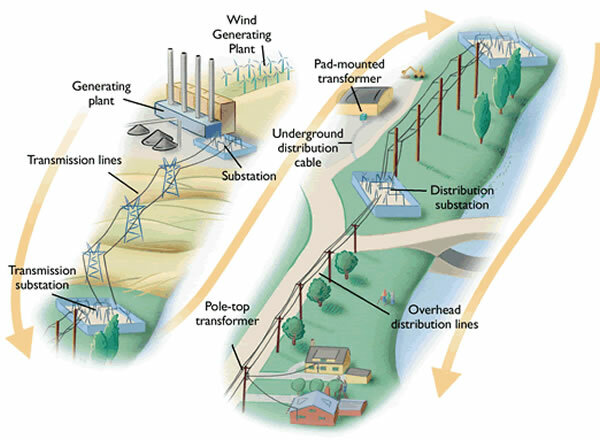 Electricity is created in power plants by using a variety of sources such as coal, oil, wood, etc. There are also other ways of creating energy such as using wind and solar energy. These sources are renewable, whereas the others are not. Wind and solar also have a lesser impact on the earth and do not contribute much to global warming, whereas fossil fuels do, but that is another debate in itself. The electricity is produced via the use of a machine that is primarily constructed of a magnet turning around in a coil of wire. Think of how you pedal your bike which turns the chain, which consequently turns the wheels and powers the bike. Similarly, in the machine power is used to turn the magnet, which created electricity. However, instead of pedals, the magnet is turned by usually steam that is created by burning the sources of power, i.e. coal, oil, wood, etc. Once the energy is created it must be harnessed and sent to homes, offices, factories, and other places where they need it. This is accomplished through a vast network of cables that connect the homes and offices to the power plant. The electric current is then sent through these high-voltage transmission lines to a substation. However, the electric current in these lines is between 4,200 and 34,500 volts, which can easily kill a person. The substation then reduces the voltage via use of step-down transformers located on the top of poles, which you might have noted in your neighborhood. The voltage is reduced to the normal 120 or 240 volts which is safe for home use and is sent to the homes, offices and factories in the substation’s surrounding area, where we access it through the wall outlets.